The right employee training, development, and education, at the right time, provides big payoffs for the employer in increased productivity, knowledge, loyalty, and contribution from employees. Learn the approaches that will guarantee that your training and employee development bring a return on your investment. "Organizations continued to make healthy investments in employee learning in 2016, finds the "Association for Talent Development’s" 2017 State of the Industry Report, which was sponsored by LinkedIn Learning and Study.com. Organizations spent $1,273 per employee in 2016 on direct learning expenditure, compared with $1,252 in 2015." This figure captures the design, administration, and delivery costs associated with learning programs, including the salaries of talent development staff. Organizations continue to exhibit a commitment to employee training and development and learning. According to the report, the average number of formal learning hours invested in employees also grew, to 34.1 hours in 2016. This number was up from 33.5 hours in 2015. This is the fourth year in a row that registers an increase in both the direct learning expenditure by employers and the number of learning hours experienced per employee. The ATD report also tells you the following about employee training content, delivery methods, and what training and development education covered. The top three areas of training content in 2016 were managerial and supervisory (14 percent), mandatory and compliance training (11 percent), and processes, procedures, and business practices (10 percent). Technology-based learning accounted for 45 percent of learning hours used, up from 41 percent in 2015. 13 percent of direct learning expenditures went to tuition reimbursement programs. The average cost of each learning hour slightly decreased from $82 to $80. Employers wisely spent their training and development funds in diversified methods of training presentation to meet the needs of their employees. Instructor-led, live face-to-face in the classroom was the delivery method chosen for 49 percent of learning hours in 2015. With this investment of hours and dollars in employee development, organizations need to make certain that their investments are wise. Every employee in every organization has different needs for training. They each have different modes of training from which they can learn most successfully. Employees have different expectations from developmental opportunities. But, the majority of your employees expect that you will invest in their long-term development. According to the ATD 2015 study, direct expenditure on employee development as a percentage of payroll increased from 4 to 4.3 percent. How training needs are determined, how training is viewed by employees, and how training is delivered become critically important issues. 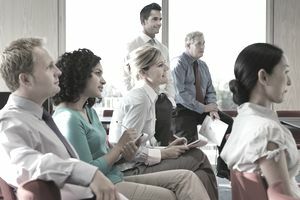 Training trends and methods for gaining knowledge, other than traditional classroom presentations, such as coaching and mentoring, take center stage. New employee orientation, or new employee onboarding, is a significant factor in helping new employees hit the ground running. Training that helps each employee grow their skills and knowledge to better perform their current job is appreciated as a benefit. The opportunity for development also increases employee loyalty, and thus retention, and helps you attract the best possible employees. Learn the approaches to employee development that will guarantee a return on your investment and ensure employee loyalty. Organizations are increasingly asking for monetary justification that the developmental opportunities that you provide for your employees produce results—and you will need to be prepared to demonstrate your results. the need for organizations to constantly develop their employees' ability to keep up with the pace of change. So, sending an employee off for a one-day seminar or a week-long workshop is only one of many options that exist now. The American Society for Training and Development, now the Association for Talent Development (ATD), has traditionally recommended a minimum of 40 hours of training a year for every employee. This is consistent with the emphasis employees place on the opportunity to grow and develop both their skills and career while in your employ. The chance for ongoing development, is one of the top five factors employees want to experience at work. In fact, the inability of an employee to see progress is an often cited reason for leaving an employer. As a retention strategy for your preferred employees, employee development rates highly. Only the employees' perception of their salary and benefits as competitive, and reporting to a manager they like, rate higher. When you think about education, training, and employee development, options exist externally, internally, and online. Choices range from seminars to book clubs to mentoring programs. In the ATD survey, over 60 percent of the expenditures employers made on employee development and education was spent internally, so it's important to recognize their contribution. Here is a summary of the existing alternatives to help your employees continue to grow. For recruiting, retention, and managing change and continuous improvement, adopt all of these practices within your organization. Create a learning environment. Communicate the expectation of ongoing, continuous learning. Offer work time support for learning. Make online learning and reading part of every employee's day. Employee development opportunities are crucial to the ongoing growth and progress of the people you employ. They are also critical to ensure their retention and success. Be creative to provide diverse opportunities for employee development. The opportunities you have to train and develop your employees are expanding every year. Why not take advantage of the opportunities when development is one of your employees' most significant expectations from an employer?